If there were one supplement that everyone should be taking daily it would be Pro Krill 1000. You already know the benefits of taking fish oil…now Live Cell Research offers a more powerful way to get your Omega-3 fatty acids without the "fishy" taste. Pro Krill 1000 naturally contains more antioxidants, it's easier to absorb, and it's safer than traditional fish oil supplements. Our Pro Krill 1000 comes from the pristine waters of the Antarctic Ocean and the krill is processed while still on the vessel to ensure freshness and purity. We do not use any synthetic or harmful ingredients, binders or fillers. Taking 2 softgels daily with a meal may help improve heart health, joint function, mental sharpness, and the appearance of your skin. Live Cell Research's Pro Krill 1000 Blend is lactose- and gluten-free. 1 bottle contains 60 softgel capsules, a 30-day supply. 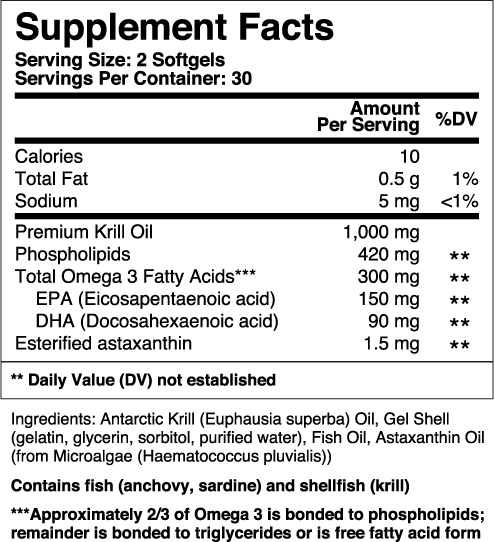 Why should I take Pro Krill 1000 instead of Fish Oil? Not only does Pro Krill 1000 contain up to 50% more Omega-3 than fish oil, it also has more phospholipids for better absorption of the Omega-3. That means you’re getting much more of the benefits of your Omega-3's with Pro Krill 1000 than you would with fish oil. Another reason Pro Krill 1000 is so much more powerful has to do with the amount of Astaxanthin, a powerful antioxidant that gives shrimp, salmon, and krill their pink color. Is Pro Krill 1000 safe? One of the biggest concerns with fish oil is the concentration of mercury, PCBs, and other heavy metals and toxins. Pro Krill 1000 contains a significantly lower risk of such toxins for two main reasons - 1) because Krill is harvested from the pristine waters of the Antarctic and 2) because krill is a much smaller organism so their bodies can’t carry the heavy metals and toxins found in larger fish. Krill is a crustacean, a type of shellfish, which means anyone with shellfish allergies should consult their physician before taking Pro Krill 1000. But otherwise, there are no known negative side effects for healthy individuals without shellfish allergies. Our Pro Krill 1000 comes in vegetarian, gluten & lactose-free capsules, and contains no synthetic ingredients, binders, or fillers. How do I take Pro Krill 1000? We suggest taking 2 softgels daily, preferably with a meal. What are the ingredients in Pro Krill 1000? 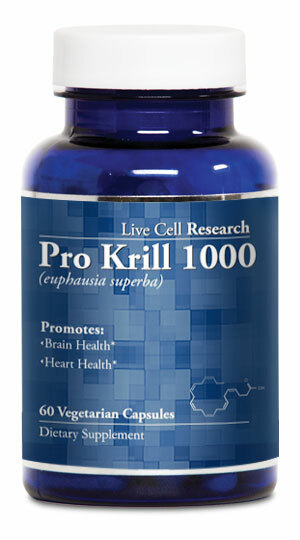 What makes Live Cell Research's Pro Krill 1000 better than anything else on the market? Our premium Pro Krill 1000 Blend contains 1.5 mg of astaxanthin per serving which is SEVEN TIMES more than Pro Krill 1000 by itself. Astaxanthin has been hailed as a powerful antioxidant, that can help the body defend itself against cell oxidation and the emergence of free radicals. Not only that, but because Pro Krill 1000 phospholipids have a higher absorption rate than fish triglycerides, our Pro Krill 1000 is blended with fish oil, which allows the Omega-3s in the fish oil to bond with the phospholipids in the Pro Krill 1000. This means our Premium Pro Krill 1000 blend actually gives you more Omega-3 absorption than any other product on the market. The standards set forth in the GOED Fish Oil Monograph are voluntary quality guidelines that are among the highest quality standards for EPA and DHEA krill and fish oils. Even though these are voluntary guidelines, we chose to strictly comply with the highest industry standards in making our premium Pro Krill 1000 Blend. What is Live Cell Research? You will only be billed for what you order today and absolutely nothing more. You’ll only be shipped what you order today, as well. Many customers have requested an auto-ship feature — and we’re working on adding that to our website — but at this time it’s still unavailable. Try Pro Krill 1000 RISK-FREE for 90 Days! This is, quite frankly, the one of most important investments you will make to the quality of your health and we want to make the decision easy for you. If you are not 100% satisfied with your purchase, we DON’T want your money! It’s as simple as that. If you do not experience improved heart health, brain function, immune function, and many other benefits with Pro Krill 1000, we want you to contact us for a full refund of your purchase price. There will be no questions asked and we will refund your money immediately. Click the link below to order and we will ship your purchase out immediately. You have 90 days to try Live Cell Research Pro Krill 1000 and see the results yourself. If you are not 100% satisfied, simply contact us and we will gladly refund your money. The whole process takes just a few minutes and you'll receive your Pro Krill 1000 package in just a few business days.